Still other researchers have made the case that there's a connection between the grooves and the Stickney impact. In the late 1970s, planetary scientists Lionel Wilson and Jim Head proposed the idea that ejecta—bouncing, sliding and rolling boulders—from Stickney may have carved the grooves. Head, a professor in Brown's department of Earth, Environmental and Planetary Sciences, was also a coauthor of this new paper. That round-the-globe rolling also explains how some grooves are superposed on top of others. The models show that grooves laid down right after the impact were crossed minutes to hours later by boulders completing their global journeys. In some cases, those globetrotting boulders rolled all the back to where they started—Stickney crater. That explains why Stickney itself has grooves. What a joke, another laughable plasma ignoramus this Ramsley. This Ramsley guy is yet another in a long line of scientists who steadfastly refuse to consider the idiotic and baseless notion that such grooves are created by humungous electrical discharges from some unexplained, and unexplainable, mysterious Flying Death Battery From Outer Space. Well, full marks to Ramsey and his team for coming up with a workable idea to possibly explain the grooves: food for thought. No thundermugs tossed by drunken deities littering the Phobos landscape. obviously not considering he studied engineering... or did you miss that? Yeah, an engineer who confuses the electric with the woo? BBQ! Electric reality will beat the woo everyday! "These grooves are a distinctive feature of Phobos, and how they formed has been debated by planetary scientists for 40 years,"
And nary a valid nor viable explanation has been put forth by the plasma ignoramuses in those forty odd years. Rolling stones? Flying boulders! The ridiculousness one will invoke to resist a simple concept is monumental, apparently. "We put all the basic ingredients in, then we press the button and we see what happens." BTW, where are these flying boulders? Are they dark boulders? Says an ignorant mug who has no valid hypothesis for this at all. All talk, no science. Wrong as usual, the same processes that is occurring on Io, Enceladus, and which creates cometary jets. Electric discharge is a simple and obvious mechanism to create all of the observed features. Now invisible boulders required. Lol. Io is volcanism, Enceladus is cryovalcanism, and comet jets are from sublimating volatiles, entraining dust and ice. As proven. Just invisible, impossible electric woo. So you acknowledge the conditions required for this electric "woo", yet claim it is impossible? You are one confused moronic puppy jonesdumb. I did no such thing. As I said, 'impossible'. Just for the hard of thinking; the Rosetta mission finished just over two years ago. That spacecraft had a whole suite of instruments, and was in close proximity to a comet for around two years. Not a single peep out of the magnetometer to show these imaginary discharges. On the other hand, the jets at 67P, and other comets have been studied. They are gas and dust and, sometimes, ice. The spectrum is that of sunlight reflected from dust. There was no electrical woo, there was no rock. The electric comet was a busted flush long before this mission ended. One would have thought that its proponents would have throw in the towel after the Tempel 1 impact results came out. Ice, gas and dust, and a crater too large to have been made in rock. The electric comet woo requires rock, because the loons who made it up think comets were blasted off of rocky planets by giant lightning bolts! I mean, what's not to believe? Lol. You acknowledge surface charging due to interaction with SW, this is all that is required for electrostatic discharge. Put this object near another charged object and there will be an electric discharge. Just like what happened to Cassini. The only thing that is impossible jonesdumb is your ability to think and reason. Not a single peep out of the magnetometer to show these imaginary discharges. Already pointed to the measured outburst that was too energetic for your faerie tales, no memory of that? Which would be too hard to drill into with Philae's SD2 equipment. And what do ya know, that is exactly what happened. You acknowledge surface charging due to interaction with SW, this is all that is required for electrostatic discharge. Put this object near another charged object and there will be an electric discharge. No, it won't, and no it didn't. No electric discharges of any kind. And surface charging essentially disappears when the solar wind stop reaching the nucleus. Which just happens to coincide with the time when the comet is most active. And which had nothing to do with any electric woo! Lol. Likely a subsurface build up of pressure, as the authors say. There was ice in that outburst! And nothing in the mag data. Only an idiot would think that the outburst was anything to do with electric woo. Drilling wasn't attempted. They hammered on it. And the velocity of the sound waves from that hammering was measured, and the properties and strength of the surface estimated from it. Neither of those properties were anything like rock. Not even close. And they sent radio waves through the whole of one of the lobes. Again, nothing like rock. They also tested the electrical permittivity of the surface. Guess what? Nothing like rock. Both MIRO and Philae tested the thermal inertia of the surface and near-surface. Nothing like rock. The density of the comet was measured by the RSI experiment, as well as the behaviour of the spacecraft when in bound orbits. Nothing like rock. tl;dr? There was no rock. Correction; it was. They had one attempt. It seems to have been unsuccessful due not to the hardness of the surface, but by drilling into vacuum! The strange orientation of the craft meant that the drill could never have reached the surface. Di Lizia, P. et al. Looks like re-entry burn on the front of that big rock, and the lines look like burning and melting of that big rock, just saying. Well, my explanation for the "why" of the electric woo loons? Is the kid who kept taking the lightbulb out of thee lamp socket. Then sticking his tongue into the empty socket until he got a shock. Repeatedly. Yep, that explains their ridiculous assertions of gibbering negative evidence. Of that I am currently positive. uhh, terme. In order for your comment to make any sense? Phobos would presently be located on the Martian surface. In case no one has explained it to you? 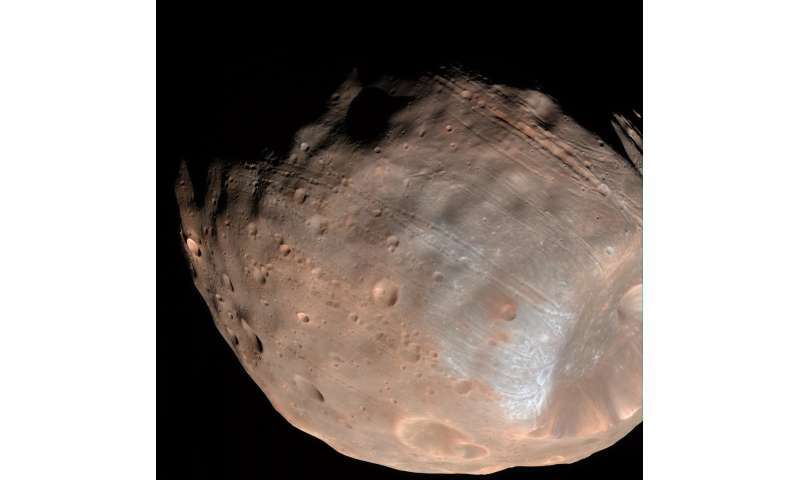 Phobos is presently in orbit around Mars. You could actually prove that to yourself with a modest telescope. I apologize that you will fail to see lightning bolts flashing off it. Try to bear up under your disappointment. Come to think of it, Consuming kegs of "beer up' might assist you in visualizing those invisible lightning bolts? Make sure you have a thundermug handy for the inevitable results of "renting" the brew. After a large, off-center impact formed Stickney Crater, Phobos received enough angular momentum (was spinning fast enough) that the secondary ejecta (mostly rocks ejected from Stickney Crater) created PARALLEL (not radial) grooves and chains of pits as those rocks rolled and bounced over and through the rotating surface of Phobos. Key facts: 1. the escape velocity of Phobos is only ~25 mph, so Phobos would not have to spin very fast; 2. 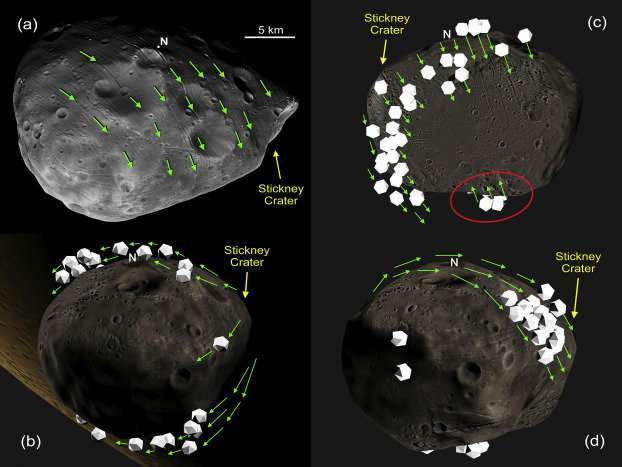 Stickney is a very large crater relative to Phobos, and the primary impactor could have imparted significant angular momentum; 3. statistically, an off-center impact is the most likely scenario; 4. this results in parallel grooves at all latitudes, as we see on Phobos, which is hard to achieve otherwise; and 5. there appear to be a few radial grooves that turned into parallel grooves . . .
TBH the thundercult cannot rely on electrostatic charging to explain things at comets. According to them comets are "just asteroids on elliptical orbits." Leaving aside the fact that there are shed loads of asteroids on elliptical orbits that don't outgas, asteroids are permanently subjected to the solar wind. which causes the highest charges. The sunlit side will go a few volts + due to photoemission. This happens to both asteroids and comets. The largest charge comes from the higher mobility of electrons in the solar wind (larger gyroradius), meaning they have access to the dark side of the body. This means that the unlit side can charge up negatively to fairly high values. This could cause some dust movement near the terminator. This effect has long been proposed for the Moon. Of course, the solar wind is getting nowhere near a comet when it is most active, but continually impacts asteroid surfaces. Zimmerman, M. I. et al. space.com> Phobos orbits close to Mars since it has no atmosphere and no magnetosphere it plows through streams of solar wind and absorbs the electrically charged particles on its dayside. This, in turn, leaves a void over its nightside. As a result, negatively charged electrons from the solar wind fill this void and statically charge the moon's nightside. Good finds JD, I'll post those links on the TB site. I can understand the deities bowling balls bouncing down the lanes of the Phobos bowling alley. And flying off into Space to bang around the theosophist flying saucers. However, what I do not understand. If the EU loons are correct? Hahahaha... uhhm. If in somr mystical fairieland the EU cultist loons were correct? Then all those beer cans the deities left littering Phobos should be magnetically stuck to the floor! And then ask the few remaining denizens of woo central why they think Thornhill was lying to them 20 years after that paper, and many others in the intervening period, which definitively detected H2O at comets. He was still telling them that it was OH! Talbott was a co-author of that execrable electric comet poster - perhaps he can explain? Can't be nice when your high priests lie to you, I imagine. Oh but jd, that's the high priest's job! To lie to their patients. Oops, silly me. I meant faithful worshipers. Yes, yes I did. goddess I'm an awful human being!